Today it seems quaint to think of people getting the time from church bells and factory whistles, but before World War I it was commonplace. People had clocks at home, and gentlemen carried pocket watches, but most people went without a watch. Wristwatches were chiefly worn by women as decorative pieces rather than for precise timekeeping. The Great War was a turning point. Crouching in a trench or exchanging gunfire with the enemy, soldiers hardly had the time to grab a watch from their pocket, open the case and check the time. They were also encumbered with gear, so that the wristwatch overcame its effeminate image to become a practical necessity. “In WWI, they could have a lot of things hanging from them—belts, whistles, gas masks—and with other equipment you couldn’t get a free pocket,” said Doran Cart, senior curator of the National World War I Museum in Missouri. For men, the wristwatch had a brief career during the Boer War at the turn of the century, but was abandoned when the conflict ended. In World War I, when timing was crucial, it enjoyed a revival among officers that eventually made it ubiquitous. The phrase “synchronize your watches” stems from World War I, because action had to be precisely scheduled, not only transport and supply delivery, but also maneuvers, according to Mr. Cart. “If an artillery barrage was about to start, no one wanted to be out in the open, and if it was time to go ‘over the top,’ no soldier wanted to be the only one rushing up out of the trench,” he said. Initially, many watches used in World War I came with a trench guard, a removable cage that protected the watch face from impact or flying objects, “like a catcher’s mask in baseball,” Mr. Cart said. “It’s fascinating how quickly retailers caught on and put trench watches on sale,” he said. 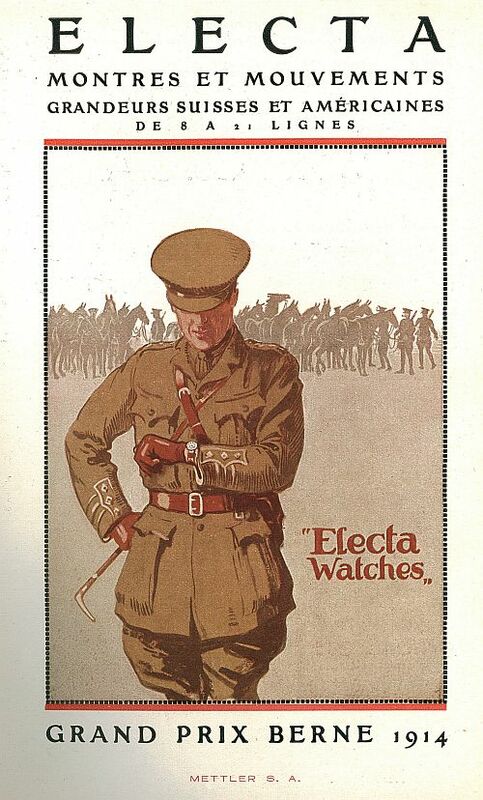 In the U.S., advertising for men’s wristwatches dates back to at least 1915, but ads came even earlier in England. Since then, cocking an eyebrow and pointing to your wrist has been as good as opening your mouth to ask the time. Some worry wristwatches will be supplanted by cellphones, but sales continue to grow. Annual revenue for watchmakers rose to $61.7 billion last year from $58.9 billion in 2012.